Other Tom has arrived at Stassi’s apartment, where Katie, Stassi, and Kristina are discussing Other Tom’s cheating. Stassi immediately calls him out for cheating, but he’s just there to drop off the flowers. Why would he put himself through that? Stassi thinks he’s being too joking about the whole thing. He’s too tired to argue and listen to the yelling. Stassi kicks him out because he won’t take her yelling. Katie thinks that Other Tom should have stood up to Stassi. By now, we know Other Tom isn’t going to stand up to anyone. Gay Pride is coming up. Natalie and Lisa have been planning the events at Sur and Pump. She doesn’t have time to plan a float this year, so it’ll just be parties. Vail, Danielle’s friend, arrives to interview for a job. Jax doesn’t waste anytime in hitting on her. Stay away Vail!!! Save yourself!!! The interview goes ok, even though she doesn’t have a ton of experience. Vail graduated from Princeton, but is now a struggling actress and hostess. Lisa tells her that she’s hired and warns her about dating other staff. Other Tom and Katie are having a romantic date. He wants to be a better boyfriend. Maybe he should start with keeping his friends from trashing his girlfriend? Katie has forgiven and moved past the cheating, but she’s still upset with Jax. She doesn’t want Other Tom to see Jax. Other Tom makes excuses because he and Jax are in the same group of friends and that Jax thought he was doing the right thing. Other Tom is frustrated that Stassi has an influence on Katie. Katie denies it. Excuse me while I roll around on the floor laughing for a minute. It’s Gay Pride day at Pump. Other Tom is back with Xanax, so there shouldn’t be a panic attack. Vail is introduced to the Sur staff. Danielle reminds Jax that he has a girlfriend and tells him to stay away from Vail. Never gonna happen. She’s going to be fighting him off for her entire career at Sur. Of course Stassi is at Pump because she can’t seem to stay away, even though she claims to hate it. She immediately jumps on Other Tom about cheating and remaining friends with Jax. Other Tom hasn’t seen Jax conspiring against him. Maybe after he sees the show? Who am I kidding? He still won’t see it. Just stick your head back in the sand Other Tom. Kristin is still with James, reminiscing about how Tom cheated on her. James is tired of everything being about Tom. Pump is slammed, but Sur is dead. Stassi isn’t sure if she wants to go to Sur. Lisa advises her to have a civil relationship with Kristen, but that’s never going to happen. She ends up going to Sur to support Katie. Everyone seems happy to see her, except for Kristen. Stassi is avoiding Jax. Because Jax isn’t making any money, he convinces Peter to let him check on Other Tom. Of course, he has some drinks while he’s there. Other Tom isn’t mad at Jax, which is ridiculous. Other Tom does tell Jax that he caused the problems, though Jax doesn’t see it that way. Kristen just can’t stop herself from talking with Ariana about last year. Why can’t she just let it go?!?! Ariana still denies hooking up with Tom before the breakup. Kristen tells Ariana that Tom is cheating on her. She doesn’t understand why Ariana is always at Tom’s apartment. Umm, maybe because that’s her boyfriend? Kristen needs to come by to talk about bills. Why do these two have bills together a year after they broke up? Stassi interrupts Vail’s training. Stassi though that Vail was fabulous, but doesn’t now that she’s hostessing at Sur. At least Vail has a job. Stassi makes some nasty comments about Scheana’s eyelashes, even though Katie has the same ones on. Scheana doesn’t understand why Stassi continually shows up at Sur when she keeps on bashing it. I don’t understand either. I think she misses the drama. Kristen is going to Tom’s, so she’s curling her hair. James doesn’t understand why Kristen cares if Ariana is there. Kristen is way too worried about Ariana. James wonders how many times Kristen is going to have to go pick up her mail at Tom’s. Haven’t they been broken up for six months? There is no reason to still have mail going there. Tom has recruited Other Tom to be there. Tom notes that she is way too dressed up to pick up mail. She immediately jumps on him for not answering texts. You are broken up!!! Move on!!! It’s just like when they were dating – constantly arguing. Once again, Kristen starts crying and leaves. Ariana returns and the Toms tell her about Kristen’s visit. Other Tom has his own issues because Kristen exaggerated the cheating rumors. He wonders why the girls had their pitchforks out for him. Hmm, I wonder? Ariana notes that Stassi is interfering in the relationship, which is what she complains about Jax doing. I love that Lisa and Natalie do their own flowers. Vail arrives late. Lisa warns her about arriving late. Vail opens up about her substance abuse struggles when Lisa asks about drinking. Not sure that I would have told my new boss about that. Lisa warns her that Jax is not the best influence and Vail should stay away from him. Vail says that everyone has warned her. Despite that, I don’t see her staying away. Katie, Stassi, and Kristina are at a cake decorating place for Peter’s birthday. Stassi warns Kristina that she won’t be friends with Vail if Vail becomes friends with Scheana. I’m so tired of Stassi’s grudges. All she does is complain about the Sur staff. Why does she continue to let them into her life? The topic moves on to Katie and Other Tom. She says that it’s unfair to tell Other Tom that he can’t see Jax anymore. She doesn’t want to regulate his friends. Stassi thinks that Other Tom should cut Jax out of his life, and that Katie should stand up to him when he won’t. Katie doesn’t see things so black and white. This isn’t Stassi’s relationship and she should stay out of it. She can say her opinion, but there’s no reason to go on and on about it and make her friend feel bad about herself. Jax, Tom, Ariana, and Other Tom are go-karting. Jax walks in and immediately makes a snarky comment about Katie. Other Tom needs to stick up for her and shut that down. Katie and Stassi return to Katie’s apartment. Other Tom tells them that he was invited to Peter’s “guy night.” Jax was also invited, providing Stassi the opportunity to jump on Other Tom about Jax. Katie just sits there and listens to Stassi tear into her boyfriend. Other Tom wants to stop talking about Jax. Katie thinks that Other Tom needs to cut Jax out of his life, but doesn’t speak up. She lets Stassi handle it for her. Lisa tastes new menu items at Villa Blanca. Now that Pump is open, she can focus more on Sur and Villa Blanca. Jax is sitting at the bar. He had a doctor’s appointment down the street and is using his employee discount for lunch. He asks Lisa about Vail. Lisa tells him to stay away. Lisa can’t take another failed relationship between Jax and a co-worker. To be honest, neither can I.
Scheana and Shay meet Kristen and James for lunch. Scheana needs to decide if Kirsten and James are still invited to her and Shay’s bachelorette/bachelor weekend in Miami. They were uninvited after the birthday party fight. Kristen seems confused by that. James is helping Scheana produce a new song, which Kristen sees as taking advantage of her. Scheana thinks that Kristen will be uncomfortable since Ariana is a bridesmaid. James and Kristen decide to go, even though Scheana never really re-invited them. Stassi wants to take Vail under her wing. Because Stassi was so well-loved at Sur and is now the expert on it. The ladies are shocked that Vail studied architecture at Princeton, but is now a hostess at Sur. Vail tells them that she began acting. She’s having trouble keeping track of the relationships at Sur. She thinks that Jax seems like a nice person. Stassi (and I) wonder how she can be so naïve. Has she never seen this show? Vail wishes that the girls would let her figure things out on her own. I mostly agree, but think she needs to stay away from Jax. Katie tells her about Jax’s lies regarding her relationship. If that isn’t a warning, I don’t know what is. Run, Vail, Run!!! Vail wants to give Jax the benefit of the doubt. She cannot be this stupid. Katie interrupts Lisa and the Pump manager. She’s really upset about Jax and wants to talk to Lisa about it. She tells Lisa about the rumors that Jax is spreading. She hopes that Lisa will move Jax to Pump. Katie is afraid that Jax will ruin her relationship if he stays at Sur. Katie thinks that Other Tom would choose Jax over Katie. But Katie still wants to marry Other Tom, even though he would choose his friend over her. Lisa correctly notes that Jax isn’t the issue – the issue is Other Tom letting her down. It seems like Katie is beginning to question whether Other Tom is the right person for her. Scheana’s manager meets her at James’ apartment to listen to the new “beat” that James has created. James is way too full of himself. Scheana was very specific with what she wanted. The new song, “Shake That,” is exactly what she wanted. She thinks James is a genius. Way to feed his already overgrown ego. If he was that fantastic, he wouldn’t still be a busboy. Tom just happens to call while she’s there. Jax and Tiffany broke up, even though he was in love with her a few episodes ago. Scheana agrees to go over and help support Jax. Whatever. James announces that he plans to have a talk with Tom before the wedding. Katie and Other Tom are seeing a counselor. Thankfully not Jax’s therapist. Other Tom doesn’t really want to be there, which is a great recipe for progress. He makes jokes, while Katie takes it seriously. They open up about the lack of intimacy in their relationship. The counselor thinks that they can move forward. Other Tom enjoyed therapy. It must have been nice to be able speak his mind and not be shut down. 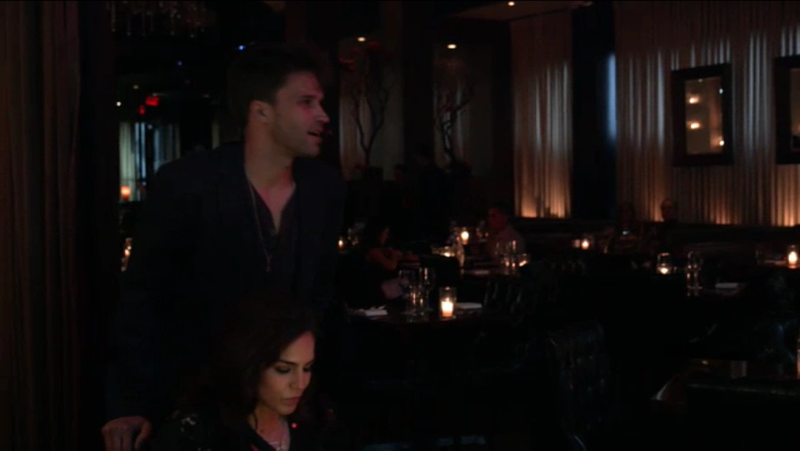 A heartbroken Jax arrives at Tom’s. He says that they aren’t actually broken up, but are just trying to figure things out. Jax texted everyone to tell them about the breakup, which may not have been the best idea when they weren’t actually broken up. Vail calls Jax and asks about his relationship. Apparently, he texted her too. He asks her to go to coffee to talk about it. He isn’t going to cheat on Tiffany, but it’s pretty clear that he wants to. Tom has forgiven Jax for sleeping with Kristen, but he won’t be friends with James again. Tom doesn’t have time for James because he will bring Kristen into Tom’s life again. Tom also doesn’t think that James is authentic. I’m so tired of that word being thrown around. Just say that James if full of sh*t and move on. Scheana is making friends with Vail. She brings up Jax’s breakup and asks how Vail knew about it. Jax texted her, though he denied it. She wonders why Jax would lie about texting her. Scheana tells her that Jax just wants to sleep with her. Vail has been told this over and over, but she still agrees to have coffee with him. This is not going to end well. Jax tells her that they are taking a guys’ trip to San Diego. Vail has Jax’s number – self-satisfied, bordering on cocky. Jax likes that Vail is very open about her past and the fact that she’s trying to better herself. Jax could learn a lot from her, but probably won’t. Vail tells him that the Sur staff has warned her about him, launching into a discussion of the sociological function of gossip. She is way too smart for Jax. She calls Jax out on the lie about the text. Jax says that he didn’t want to admit that to Scheana and Tom. Will he every just be honest? He complains about having to try too hard in his relationship with Tiffany. Ugh, Vail thinks that Jax seems like a nice guy. James approaches Tom at work, to chat and clear the air. They sit at a table. James makes it clear that he just wants Shay to have a good bachelor party. Tom says that they already talked and agreed to ignore each other. James doesn’t understand why Tom hates him and not Jax. Tom is honest, telling him that he doesn’t need James in his life. He can’t have Kristen in his life because she is trying to destroy him. James doesn’t like listening to Kristen talk about Tom, but also says that she isn’t obsessed with Tom. They, again, agree to ignore each other. Kristen approaches Tom and accuses him of cheating on Ariana. Why does she care? Why is she involved? Tom just wants her to go away, as would I. Kristen needs to get a life. She seems happy to have angered Tom. James jumps in and Tom walks away. Smart idea! This entry was posted in Vanderpump Rules. Bookmark the permalink. Good morning everyone. Merry Day after Christmas. I hope you all had a great day. Happy Birthday Just Another Mary. Boy oh boy were you a great gift to your parents. Have y’all been watching OC marathon? Happy Birthday JAM!! Hope you had a wonderful day! I’ve just been reading a few sites about Tre and her reporting to Danbury is a few weeks. Articles say she’s nervous. Of course. She’s scared Joe won’t be able to care for the girls. Of course. That the girls will be homeless cuz Joe’s can’t take care of them. Huh? They won’t be homeless. That when Joe is in prison she’s going to divorce him. I don’t think so. That Tre is thinking about having friends take the girls. I don’t think so. There’s too much family that can help Joe. I never thought Joe could do everything. I figured their mothers would love there and do cooking, cleaning, helping to get them ready for school and bed at night, and Joe would make sure they get to school, activities, help w/homework. I guess he can do some homework. Their parents probably won’t be able to help w/that. I can see Joe’s mom moving in to mother the girls. T’s mom has a not all that healthy husband to take care of. I just hope Joe’s mom doesn’t sell her own home, cause I have doubts about how long Casa Tre & Joe will remain C T&J. I lived in West Oak Lane. Oh ok-I’ve obviously heard of it-but I had to ask my husband exactly where it was! He has patients out there and it has its sections, but it’s not too bad. (I don’t know how long you’ve been gone from the area). I know some parts of town better then others and I’ve been lost driving in some bad ones-up by Temple, in the Badlands. That was fun. When I started college at Saint Joes (I transferred out, I didn’t like it) you had to be careful too. Did you keep your team allegiance? Do you bleed Eagles green? Genos or Pats? Lol. A few years ago when Mary’s husband from DC would do his asshat awards we had the best discussion about philly-how his family would cringe when he’d buy soft pretzels off some guy on the corner. Next week is the Mummers! They’ve changed it all around-its not the same. We moved from there when I was 9, so I didn’t have much Eagles or Phillies allegiance. And never had to make a Genos/Pat’s distinction. We had the ones at the nearest sandwich shop. We never watched games and maybe in summer we might have a transistor radio on. I don’t know what the old neighborhood is like now, it went sort of south after we moved. We lived on Weaver st between Thouron (sp?) and Forrest. I went to Pennypacker and would have gone to Edmunds Jr High and Germantown High. We used to sit on Jimmy’s lawn (on Sharpnack) to watch the 4th of July fireworks from Temple Stadium. I’ve also heard that area called “Mt Airy”. When we moved to Ohio, I missed the steak sandwiches, tastykakes, and soft pretzels. They’ve got plenty of support from joes family. After the raid debacle, I think most of the stories are just that-stories. I dunno. I’ve been reading a lot if stories about the girls homelessness, Teresa’s desperation to find them a home blah blah. I wonder if something is actually going on. As in a Juicy walking away because he’s in the throes if alcoholism. Stories? Or no smoke without a fire? Any which way? I truly hope those kids will be okay- I’ve become attached to them- particularly Milania. Fercrissakes. Move back to Paterson. Or something. Lol. right? Leaving your kids with their dad for an extended period of time puts fear in any mother! Even if they don’t have the Juicys problems. Dads just aren’t moms. I leave my kids with my husband (but I have friends who won’t-even for a few hours) all the time-it’s good for everyone. But, I’d be a mess if it was for 15 months. Even so, I wouldn’t move them out of their house. That would make life worse by far. Family would step in to help. I think that’s what will happen here. Well, Gabriella is probably going to need to have THE TALK while Tre is at camp and I don’t think Juicy is going to be the person to have that talk with her. And I don’t think Gia would be good for it either. I’m a hugger. This makes me smile. So sad. No matter what the cause. I have 3 rules about paranoia. You’re all welcome to use them as needed. 1. Those people who are following you around and watching everything you do? They’re Hollywood Talent Scouts looking for The Next Big Star. B. Just because you’re paranoid doesn’t mean they’re not out to get you. III. When everybody IS out to get you, being paranoid is just Good Thinking! My mother used to get me presentable to go out in public by telling to brush my hair- you never know if the paparazzi are watching.